Rajwada Pebble Bay is one of the residential developments by Rajwada Group, located in Kolkata. The project offers 2BHK and 3BHK flats at very competitive and affordable price. It is well planned and is built with all modern amenities. Where is Rajwada Pebble Bay located? Pratapgarh, a prime residential locality for house seekers in Kolkata South. What are sizes of apartments in Rajwada Pebble Bay? 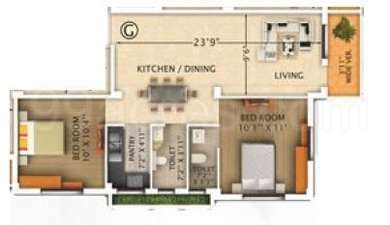 The apartment sizes in the project range from 810.0 sqft to 1120.0 sqft. What is size of 2 bhk in Rajwada Pebble Bay? 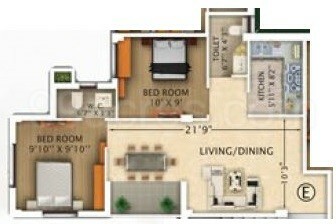 The area of 2 BHK apartments ranges from 810.0 sqft to 1030.0 sqft. How many units are there in Rajwada Pebble Bay?The project offers a total of 24 units. Does Rajwada Pebble Bay have lawn tennis? The project doesn't have lawn tennis. you of top notch security system within the complex with CCTV cameras for extreme vigilance and monitoring. Offering luxury and premium lifestyle, these projects will provide you 1, 2 & 3 BHK apartments situated in green serenity and calm surrounding will be an excellent option for a relaxed life.